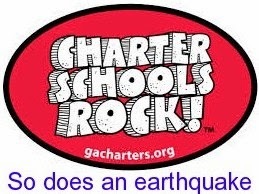 I am not opposed to charter schools in principle, but their flourishing has significantly contributed to the deficits many public schools are experiencing. In other words the state is partially at fault for these deficits. Take Detroit as an example. DPS has the infrastructure, buildings and other overhead, to handle a much larger student population then it presently has. This is because of : 1. The city is losing population and 2. charter schools are taking students from the public schools and funding from the state goes with the student. When a student leaves the public school system and goes to a charter revenue flows away from the public school but much of the fixed cost of owning and operating a building remain with the public school. The states' own policies are contributing to mounting deficits at many public schools. To add insult to injury the state then threatens to take over financially troubled schools and turn them over to an Emergency Manager and so far the schools under emergency management have not done very well. The state needs to address this issue and quit pointing the finger solely at the local school districts. Reform is needed.